If you have some missing teeth that you need replaced, it is likely you are weighing your options as to which route to go. When it comes to missing teeth, there are usually two general options: the traditional bridgework and the newer dental implants. A dental bridge is a dental restoration that replaces missing teeth by bridging the gaps left behind, hence the name. 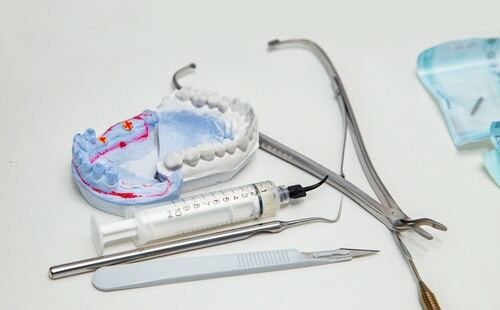 The way dental bridges work is that they are permanently cemented in place and can only be removed by your dentist. 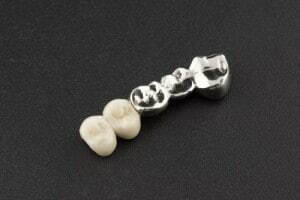 A dental bridge consists of three parts-the false tooth in the middle and the anchoring crowns on either side of the tooth. The anchoring crowns are fixed to the teeth on either side of the gap. In order for these crowns to be properly fixed, your dentist will be required to shave or file down the crowns of your natural teeth, as this will allow space for the false crowns to be attached. It is important that the natural teeth be healthy enough for this to work. The biggest disadvantage in bridgework is the involvement of the other teeth, and the fact that the filing/shaving cannot be reversed. Once the teeth’s natural crowns have been interfered with, your teeth cannot be used as natural teeth again. Filing down the enamel of your natural teeth increase your chances of decay and requiring a tooth canal afterwards. 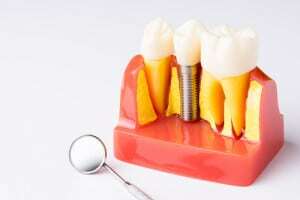 A dental implant is an artificial tooth root that is sunk into your jawbone, to provide the foundation onto which a false crown can be attached. Implants have gained popularity over the years owing to the fact that they are very real looking and functioning. After implantation, you can resume your normal life without ever having to worry about your implants. All you have to do is take care of the implants as you would your real teeth, through regular and proper brushing and flossing. In summary, the following are the pros and cons of dental bridges and implants. Need special floss and brush. Since the false crowns are attached to the adjacent teeth, you cannot clean between the teeth which could cause decay.